Free Christmas cards can be shared in many ways and opened on Christmas Day. Use our Christmas eCard maker to create this season’s free Christmas cards. Then, you can share each one in an original way. Print our online Christmas cards and give them out when the presents are opened. For distant loved ones, you can send your Christmas eCards by email on Christmas morning. You can even bless a whole bunch of people at once by posting your online Christmas cards online to social media, where all your friends can read it. Smilebox Christmas card maker produces wonderful and free Christmas cards without requiring any type of skill. In just a few minutes, you can choose, personalize and email Christmas cards to the people who mean the most to you. It doesn’t stop at email, though! You can also share your creation on social media, print at home, save for later and more. With a couple of clicks, the Christmas card maker will send your creation to all of your friends and family. Facebook Christmas cards can be shared through private message or on your wall for everyone to see. This leaves a lot more time to focus on the holiday. After finishing up your free, personalized Christmas eCards in a jiffy, you can get back to cooking, decorating, preparing the tree, and getting ready for church. But don’t forget to check your email once in a while as your loved ones respond to the thoughtful digital Christmas cards that you sent to them! The Christmas card maker is user friendly and intuitive. See below how easy it is to personalize your Christmas card online. Our Christmas eCard maker is loaded with online Christmas card themes of all sorts. Look through the list and choose your favorite, and then click “Personalize”. With Smilebox, it’s easy to make Christmas eCards with photos. Easily upload pictures from your phone, computer or social media to your free Christmas photo eCards. Simply click “Add More Photos”, then the instructions will tell you how to load it to the online Christmas card maker. 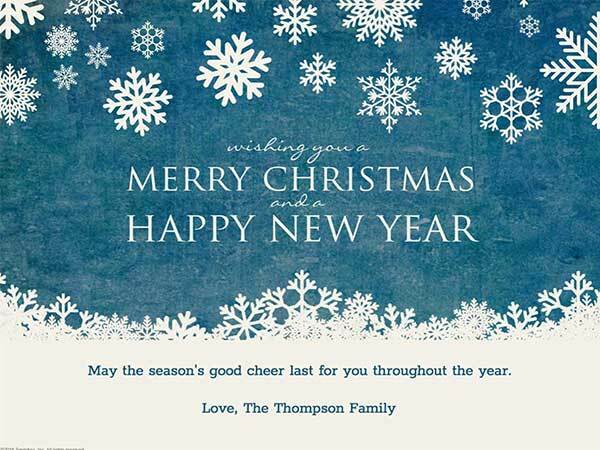 Changing the text, fonts, and colors of your online Christmas card is quick and easy. All you need to do is click the personalization window buttons or type in the desired text. Each change is updated immediately in the online Christmas card maker. After doing a last check to see that all the details are correct, you can email, print, and post your online Christmas card to social media - Facebook, Instagram, Tweeter or Pinterest. After picking a design for your online Christmas card, you can also change the picture. The online Christmas card maker gives you the choice of photos stored on your computer, phone, and social media accounts. If you aren’t sure which photo is most appropriate for your online Christmas card, you can insert several into the viewing pane of the personalization window, and click on each to see if it is the best match. Using our Christmas card maker over the years will result in a great collection of holiday images. What could be better than electronic Christmas cards that trace the growth of your family over time? Each Christmas, you can reminisce over the fun you had during the previous season. The same is true for loved ones. Sending an online Christmas card every year to your family will give them something to look at during Christmas time, especially if you can’t be together. And, when you all finally meet, make sure you take a picture to use for next year’s online Christmas cards. It’s time to make some eCards, Christmas style!